Home › Uncategorized › Get back to work! Is this unprofessional? My cubicle? I’ve been wondering about it for a while now, and then I read the much debated cover story from The Atlantic magazine, “Why Women Still Can’t Have It All,” and my wonder turned to concern. 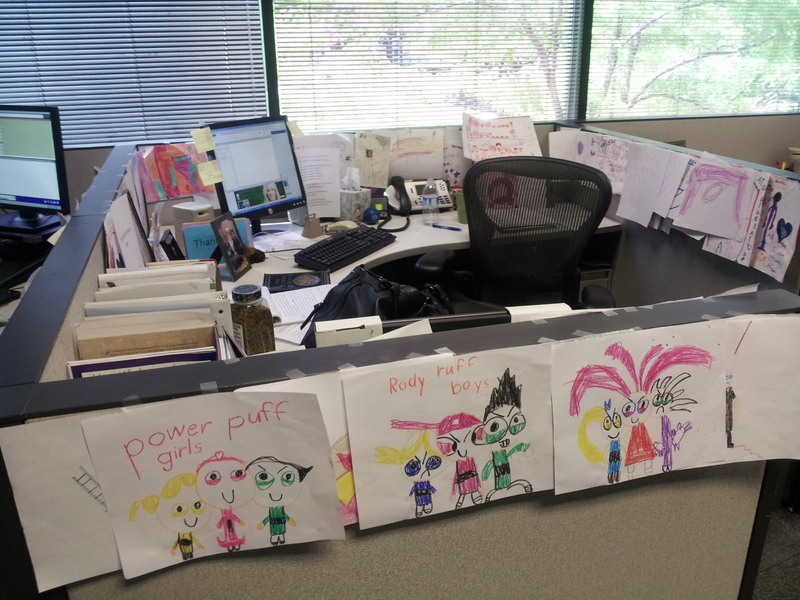 My cubicle is wallpapered with drawings my children create, two or three deep. I bring them every other day (well, at least on Mondays) and Scotch tape them all around the sides. When the kids come to see me, they like seeing their creations displayed (“ Mommy really does remember me when she’s at work!”) but that’s not why I put them up. I put them up to feel like they’re here with me. As I write this column, I am surrounded by “I love you Momy” (Okay, Ethan is working on his spelling) and drawings of really tall stick figures. My question for you, and I’m ready to hear the answer even if it’s “yes,” is: Is my cubicle unprofessional? The displaying of children’s art wasn’t discussed specifically in The Atlantic article. The article talked about the related issue of whether it is unprofessional to talk about your children at work. Hmm. Trying to extrapolate from that to my cubicle. Ah-hah! 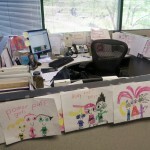 Am I building connections with my cubie mates by displaying my kids’ art? Maybe. Oh, oh. That sounds very close to children’s art posted everywhere. My loud wallpaper, however lovingly created, may be a distraction for my coworkers. After all, this is a newsroom. Very serious topics are discussed and covered here every day. Which is not to say that we don’t lighten it up around here. We do, regularly, but I’m not sure that my mates appreciate feeling the presence of my little ones the same way I do. And they can’t escape them. These are close quarters. No lactation rooms here, just potentially annoying art. Should the art be seen as something that uplifts and sustains a woman who works long and (without getting out too many violins) some might say difficult hours, or should it be seen as unprofessional and a possible distraction to my co-workers? I am willing to accept the jury’s decision, whichever way it comes back, because I sense I may be near the edge here and need some direction from my peers. And by the way, my boys don’t do Pez. Just chocolate.